GLOW’s goal is to double the available scholarships for 2018 school year. Rahab was born in Murang’a and is a member of the Kikuyu and Kamba tribes. Her parents separated when Rahab was young, and it was a struggle for her family to provide her with school fees and basic necessities. Because of her leadership skills and good grades, Rahab was awarded a scholarship to Daraja Academy. Her favorite things about Daraja Academy is the sisterhood and diversity that can be found on campus. Rahab’s smile is contagious and a testament to her gentle and kind nature. Her favourite subjects are math and physics. In her spare time, she loves singing, dancing and traveling. Rahab hopes to attend the University of Nairobi or Kenyatta University to study aeronautical engineering and business management. Esther was born in Nanyuki, and belongs to the Kikuyu and Luhya tribes. She has two brothers and one sister. Her father left when she was six years old, leaving her mother to raise Esther and her siblings alone. Her mother often had a hard time providing enough food for her family, and would rely on support from neighbours and other community members. Esther’s good grades and leadership qualities earned her a scholarship to Daraja Academy. Esther likes to watch films and listen to music, and she loves to discuss the meaning behind song lyrics and inspirational quotes. She keeps up with trends in technology, and she is always called upon to help presenters with their audio-visual needs on the Daraja campus. She has the uncanny ability to make any old piece of equipment functional, and she is always quick to step up and help anyone who needs it. 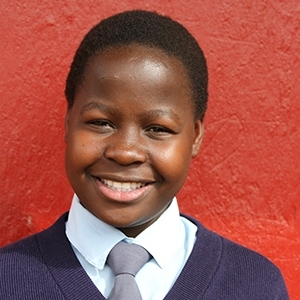 Esther’s favorite subject is math and she would like to attend the University of Nairobi to become a data analyst. Her dream job is to work for a well-known corporation, and she has her eye on a large nuclear plant project that is up and coming in Kenya. Velma was born in Homa Bay, and belongs to the Luo tribe. Before she became a teenager, her mother disowned her after a disagreement. Velma had to work hard on her own to pursue education, and eventually she was awarded a scholarship to the Daraja Academy due to her good grades and leadership qualities. Her favorite thing about Daraja is the curriculum, and the value placed on developing leadership skills in students. Velma has no problem remaining calm in stressful situations, and possesses an air of maturity that speaks to the fact that she is wise beyond her years. She often thinks about the future and dreams of higher education in the form of an undergraduate degree as well as graduate school. Velma’s favorite subject is physics, and she loves to read novels in her spare time. Her dream is to attend the Massachusetts Institute of Technology to study electrical engineering. Velma is a bright, shining star at Daraja Academy and there is no doubt that with the financial resources required for university tuition, she will go on to become a leader in a field traditionally dominated by men. Edith was born in Kisumu and belongs to the Luo tribe. She has one brother, and was raised by a single mother who often struggled to provide money for food and school fees. Because of her leadership skills and good grades, Edith was awarded a scholarship to Daraja Academy. Edith’s favorite subjects to study are history, english and math and she loves to read inspirational books in her spare time. Edith’s favorite thing about Daraja is the W.I.S.H. curriculum, which teaches students how to become women of integrity, strength and hope. Edith’s favorite quote is “The only thing worse than being blind is having sight but no vision” by Helen Keller. Edith hopes to attend the University of Nairobi or Kenyatta University within Kenya, but she also has a dream to study at the University of California. She plans to study international relations or journalism with a focus on human rights. Mary was born in Narok and belongs to the Kikuyu and Maasai tribes. Her mother was unable to care for her, and at the age of six years old she started living with her uncle and aunt and their four children. Mary learned about Daraja Academy through her primary school teacher, who encouraged her to apply for admission based on her good grades and leadership qualities. Her favorite subject to study is business. In her spare time, she loves reading inspirational books and journal writing. Mary is warm, kind and often likes to say hello with a hug. She possesses strong interpersonal skills that help her to connect with those around her. Social and polite, she gets along well with others. She spends a lot of time thinking about her future and what she would like to do once she enters the workforce. Mary wants to go to the University of Nairobi in 2018 to study community development. Her goal is to work in her community, and eventually become a successful businesswoman and own her own business. Her favorite thing about Daraja is that it has given her a home and helped her to love who she is, despite where she came from. She credits her education for helping her to realize how important she is. She notes that in Kenya, women are traditionally controlled by fathers and husbands. She believes that if women are educated and empowered, they can change their community and the world. Abdia was born in Marsabit County and belongs to the Borana tribe. She was raised by a single mother and has one brother and one sister. Abdia spent a lot of time alone when she was younger, as her mother was often away searching for food. Because of this, she did not consider herself to be naturally sociable, and she worked hard to become the outgoing, charismatic person she is today. Her good grades and leadership qualities earned her a scholarship to Daraja Academy, which she credits for helping her to become more confident and outgoing. Abdia is calm and composed, and extremely gifted at public speaking. She has often been called upon to act as the Master of Ceremonies at gatherings and assemblies, and she is able to entertain and put a large crowd at ease with little preparation. Abdia hopes to attend the University of Nairobi to study international relations. Her favorite subject is math, and she is interested in all topics related to diplomacy. In her spare time, she likes to read motivational novels and watch films. Her dream is to become an important part of her community, and she would like to start an charitable organization focused on assisting young boys who abuse drugs and alcohol.